Held as a part of the Crescent's 25-year Silver Celebration, the annual Crescent Fall Celebration 2011 was held in the Rosewood Crescent Fountain on Friday, September 30, 2011. Chef tasting stations lined the outdoor courtyard as guests grazed on delicious nibbles from the Rosewood Mansion on Turtle Creek, Rosewood Crescent Hotel, Arcodoro & Pomodoro, The Conservatory, Capital Grille, The Crescent Club, Nobu, and Palomino. 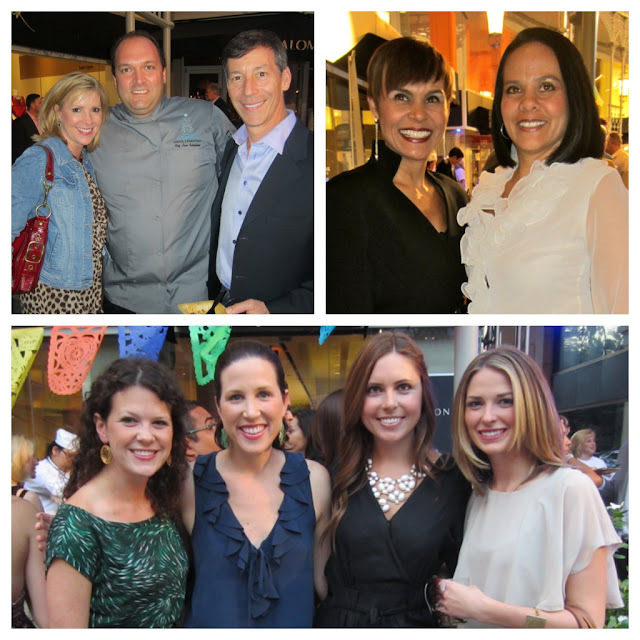 There was also an art auction by Linearis Institute for Works on Paper, a silent auction, cork pull benefiting Les Dames d'Escoffier Dallas Scholarship Endowment Funds, fashions by Stanley Korshak, and mini spa experiences by The Spa at The Crescent. The only thing that would have made it better was more people! The crowd was a little light and I'm not sure why there wasn't a better turnout. But, you know me, I'm a reality TV star magnet so I was not surprised to run into Connie Dieb from Big Rich Texas and her sister Camille Umland who is her partner in their upscale consignment shop Uptown Consignment. Just another day in the life!